Converting .mov to mpeg. My Canon camera clips are .mov files. When converting from .mov to mpeg for my PC, there seems to be something like a five times increase in the size of the files. I keep getting caught out on this one when trying to finally create DVDs. Hope someone out there can help. Many thanks! -- from PC Adviser. Have a bunch of MOV files and need to convert these MOV files to MPEG format for burning to DVD or for editing and playback on PC? Thankfully, it's easy to get this done with good reliable MOV to MPEG converter software. In this tutorial, we'll walk you through how to convert MOV to MPEG on Windows or macOS. 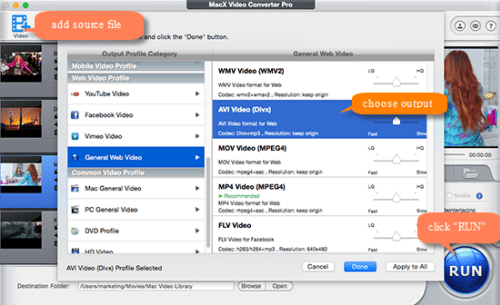 There're various free MOV to MPEG converters, here we recommend using MacX Video Converter Pro. People who regularly use this cutting-edge video converter will know that the program is frequently updated by its developers. It has been and remains the best MOV to MPEG converter, which now gives at least 5x faster MOV to MPEG (MPEG 4/3/2/1 etc.) conversion speed and nearly original quality output thanks to its Intel QSV, Hyper-threading tech, Multi-core CPU processing and High-quality Engine. It's stable and easy to use. You can follow the guide below to give it a shot. The MOV to MPEG converter uses modern UI, and you'll find it won't take a long time to study user guide. Before you start, free download the MOV to MPEG converting software for macOS (macOS Sierra/El Capitan or older) or download Windows version (Win 10 also compatible) and launch it on your computer. No worries about any extra plugin, ads during the installation process, the tool is 100% clean. Step 1: Load source MOV files by clicking "Add Video" icon on the top-left corner and selecting MOV files from Final Cut Pro, iMovie, QuickTime, or cameras like Sony, Nikon, Canon, and Olympus etc. to convert to MPEG. The MOV to MPEG transfer tool allows converting multiple files at a time. Step 2: Once .mov files are loaded, a window will pop up, enabling you to select output profile. Click General Web Video under Output Profile Category, scroll down and select MOV Video (MPEG4) or MP4 (MPEG4) or others, then click "Done". You can click Settings button to reset video resolution, bit rate, frame rate, audio channels and more. Step 3: Now, click "RUN" to start converting MOV to MPEG on Mac or Windows for creating DVD, or editing on Windows Movie Maker or playback on HDTV, PCs, Android mobile devices etc. 1. When you convert MOV to MPEG using the best video converter for Mac/Win, you can compress MOV files, adjust video frame rate, resolution, bit rate, audio channel, audio bit rate, add watermark/subtitles and more, which comes very useful especially if you convert change MOV footages, clips, movie video files to MPEG format for burning PAL/NTSC DVDs. 2. The MOV to MPEG changing software can convert almost any type of videos, for example, MKV to MP4, WMV to MOV, MP4 to WebM, H.265 to H.264, MP4 to MP3, MOV to AVI, AVI to MP4, you name it! 3. You can download online MOV movies videos to MPEG 4. In fact, you are free to download videos from YouTube, Dailymotion, Vimeo, Instagram, 300+ sites in any format and any resolution. The maximum of file size you can convert using Convertio is 100MB. Internet connection is required. The MOV to MPEG conversion speed will partly depend on network speed. Keep an eye on the file extension you plan to download to avoid installing any adware on your computer. 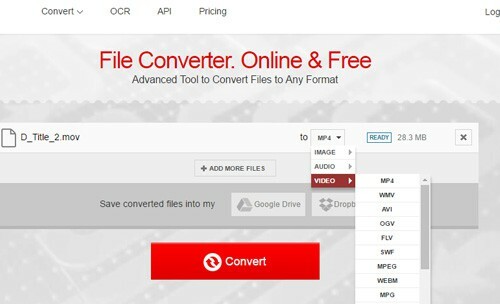 Step 1: Open Convertio website, look at "Select Files to Convert", and click the red button to select MOV files to convert to MPEG or just drag and drop the source MOV file on this page. The free video converter allows adding more than one MOV file to load at a time. Step 2: Click the menu next to "to", and select VIDEO, then choose MPEG from resulting format list. Step 3: You can save converted files into your Google Drive or Dropbox. Step 4: Click "Convert" red button and source MOV files will start to upload. When it's finished, click "DOWNLOAD" to save the converted MPEG file from MOV to your computer. It can convert MOV to WMV, MOV to AVI, VOB to MP4, and transcode other popular video formats. MacX Video Converter Pro is the best MOV to MPEG converter for macOS and Windows, which can convert MOV to MPEG with good quality, 5x faster speed than free (online) MOV to MPEG converter. No size limits, no ads, no plugin, no extra software.